Saturn V is the rocket famous for delivering the first men to the moon during the Apollo 11 Mission. 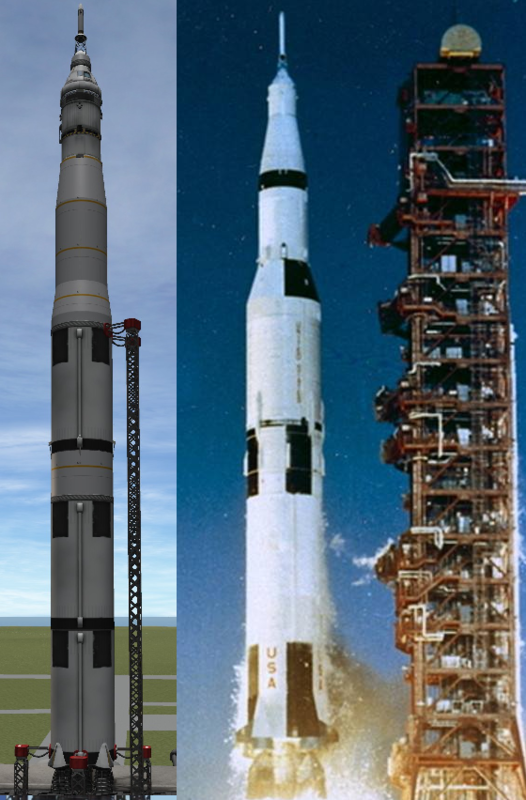 Designed with correct staging in mind, this stock version of Saturn V resembles (as far as i could tell) the layout of the Saturn V as closely as It can with stock parts. The layout of the rockets staging was based upon the real ships stages outlined in the book 'Spaceflight The Complete Story from Sputnik to Shuttle' forwarded by Buzz Aldrin as a reference while building. Fairings are used on the Third stage for aesthetics as stock parts can not correctly represent the tank size for this stage. -Either of the above mentioned locations will work. Putting the craft file directly into your Ships\VAB folder will only make the game think its one of the stock pre-built vessels, whilst putting it into your save game VAB folder will treat it as a any other vessel that you have built.